This article is about the village in Kalamazoo County. For the five townships named "Richland", see Richland Township, Michigan (disambiguation). Richland is a village in Kalamazoo County in the U.S. state of Michigan. The population was 791 at the 2010 census. The village is within Richland Township, about nine miles northeast of Kalamazoo. According to the United States Census Bureau, the village has a total area of 1.01 square miles (2.62 km2), all land. As of the census of 2010, there were 751 people, 347 households, and 221 families residing in the village. The population density was 743.6 inhabitants per square mile (287.1 /km2). There were 376 housing units at an average density of 372.3 per square mile (143.7 /km2). The racial makeup of the village was 94.7% White, 0.4% African American, 1.2% Asian, 0.3% from other races, and 3.5% from two or more races. Hispanic or Latino of any race were 1.5% of the population. There were 347 households of which 24.8% had children under the age of 18 living with them, 52.4% were married couples living together, 8.9% had a female householder with no husband present, 2.3% had a male householder with no wife present, and 36.3% were non-families. 33.7% of all households were made up of individuals and 19.6% had someone living alone who was 65 years of age or older. The average household size was 2.16 and the average family size was 2.75. The median age in the village was 46.8 years. 21.6% of residents were under the age of 18; 4.1% were between the ages of 18 and 24; 20.9% were from 25 to 44; 31.4% were from 45 to 64; and 22.1% were 65 years of age or older. The gender makeup of the village was 43.9% male and 56.1% female. As of the census of 2000, there were 593 people, 258 households, and 170 families residing in the village. The population density was 494.4 per square mile (190.8/km²). There were 301 housing units at an average density of 251.0 per square mile (96.8/km²). The racial makeup of the village was 96.29% White, 0.17% African American, 0.17% Native American, 1.35% Asian, 0.17% from other races, and 1.85% from two or more races. Hispanic or Latino of any race were 1.52% of the population. There were 258 households out of which 29.5% had children under the age of 18 living with them, 54.7% were married couples living together, 8.1% had a female householder with no husband present, and 34.1% were non-families. 29.5% of all households were made up of individuals and 14.3% had someone living alone who was 65 years of age or older. The average household size was 2.30 and the average family size was 2.84. In the village the population was spread out with 24.6% under the age of 18, 5.1% from 18 to 24, 26.8% from 25 to 44, 26.3% from 45 to 64, and 17.2% who were 65 years of age or older. The median age was 43 years. For every 100 females there were 80.2 males. For every 100 females age 18 and over, there were 78.1 males. The median income for a household in the village was $50,938, and the median income for a family was $58,542. Males had a median income of $42,250 versus $30,956 for females. The per capita income for the village was $23,777. About 1.2% of families and 1.4% of the population were below the poverty line, including none of those under age 18 and 7.5% of those age 65 or over. Richland is located in the middle of what was once the Gull Prairie, an upland area relatively free of trees and maintained by natural and man-made fires. The area had a few Pottawatamie villages, one was located on the west side of nearby Gull Lake. Fish and game were plentiful, and the land was very fertile. Since there were few trees to clear, the prairie was among the first areas of Kalamazoo County to be settled. By the 1830s, the Native Americans had been moved west, and Richland was a thriving frontier village. 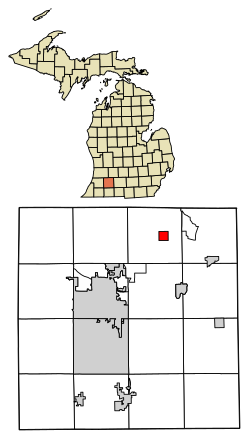 The village even contended with Prairie Ronde for the county seat, but the centrally-located village of Bronson (now Kalamazoo) was ultimately chosen. Lacking a flowing stream that would have provided water power, Richland never developed significant industry and remained a sleepy farm community until the late twentieth century. In the 1980s and 90s, small employers such as Richard Allen Medical moved to the edge of town, and Richland became a bedroom community for Kalamazoo. The high quality of the local Gull Lake School District also drew people from surrounding areas. New subdivisions were built in what had been hilly farm country. ^ a b "US Gazetteer files 2010". United States Census Bureau. http://www.census.gov/geo/www/gazetteer/files/Gaz_places_national.txt. Retrieved 2012-11-25. ^ a b "American FactFinder". United States Census Bureau. http://factfinder2.census.gov/faces/nav/jsf/pages/index.xhtml. Retrieved 2012-11-25. ^ "Population Estimates". United States Census Bureau. http://www.census.gov/popest/data/cities/totals/2012/SUB-EST2012.html. Retrieved 2013-06-03. This page uses content from the English language Wikipedia. The original content was at Richland, Michigan. The list of authors can be seen in the page history. As with this Familypedia wiki, the content of Wikipedia is available under the Creative Commons License.